When you think about the future, what comes to mind? Do you start with work and go to life? Do you start with family and then go to career? Can you imagine your work/life a year from now? Can you “image-in” experiences you hope are on the way and (perhaps) even plausible surprises that could show up? This is NOT “wishful” thinking. It’s your chance to direct your thoughts and energy toward what will change your future. There’s a secret to getting (more of) what you want from your life and your work. In just a moment, I’ll coach you to arrange the group of 10-25 people you talk with the most into three distinct categories. No one person is enough for you to build a future that’s bigger and better than the present. Look around, there are people you spend time with today that you didn’t know 5 years ago. Your life looks what it looks like today BECAUSE OF the people you spend more (or less) time with. Think about your work, your life, your community, your family and – of course – your age. What do I ALREADY know is on the way that I’d like to spend ENOUGH time thinking about, working toward or managing with grace and ease? No matter what day you’re reading this (or watching the video at the bottom of this post), you’re going to be doing something, somewhere, spending time with SOMEone within a couple of days. As you’re getting ready to take on your next project or step toward a promotion or begin making a work / life change, think about how you can think in those terms. Once you’ve done the thinking about TIME, now it’s time to think about PEOPLE. I smile as I write this, “My visionaries are the people who can easily “add a zero” to my thinking. If I tell them I’d like to write a 1,500 word article, they ask me if it could be a 15,000 word booklet. If I share a goal to speak at a conference with 50 people, they challenge me to apply to speak at one with 500. If I plan to enroll another 100 members into the GET MOMENTUM Leadership Academy…you get it. Have you ever told someone you’d meet them at the gym? Have you ever asked someone to edit a paper or slide deck you are building? 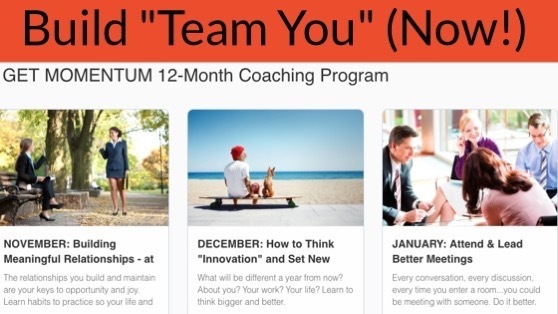 Have you invited someone to enroll in a course or program (like GET MOMENTUM!) with you? If so, you intuitively understand the value of having someone to hold you accountable. Think about it: The next 60 months are going to go by in a flash. Not convinced? Write down the year 2013 and ask yourself, “How fast have the past 5 years gone?” In order to get to where you’re going, find the three kinds of people to share your dreams with and you’ll go further. Ready? More than 100 College Seniors heard about the three kinds of people to share their goals with. If you know of someone who could benefit from thinking this way, please do share this with them! As you watch that video, leave a comment with YOUR ah-ha or I’m gonna. I’ll check those comments from time to time and add any coaching I can!